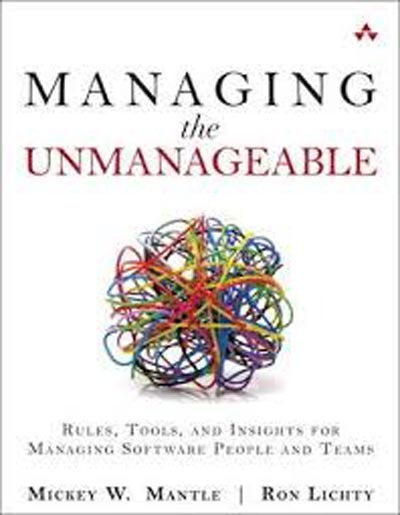 The book “Managing the Unmanageable” starts with the observation that software development projects have always difficulties to be successful, which might explain the title of this book. The authors share in it some techniques and approaches to improve this situation, based on their long experience as software development managers in large companies like Apple, Pixar or Sony. I will recommend this book to every software development manager or project manager as it provides a lot of valuable material about the hiring and management of software developers and software projects. It is also a good book for developers that want to understand their colleagues or improve the working relationship in their teams. Given that our craft has amassed over 60 years of experience and our industry has spent enormous numbers of hours and dollars/yen/rupees/euros trying to bring this discipline under control, how can it be that software development remains so unmanageable? In this book we answer that persistent question with a simple observation: You first must learn the craft of managing programmers and software teams. That is, you must learn to understand your people – how to hire them, motivate them, and lead them to develop and deliver great products. The next important thing is to inherit, hire, and/or build a good technical staff. As we are both fond of saying, “The single most important part of our job is to make sure we hire right.” If you hire great staff members, the other parts of your job are easier. If you don’t, you usually don’t have time for other parts of your job since you’re too busy dealing with the problems that always seem to be plaguing you. It is essential to creating and nurturing a successful programming culture that you understand what “successful” means for your company, your organization, your project, and your team – and how to measure it.